I don’t get it? I thought power forwards were supposed to take longer to develop? That’s just what people say when they aren’t working out. Come one JD, we know the real reason you didn’t like Tkachuk is because he plays a tough game. Call it the “big man” bias. Anyone with size and toughness is automatically assumed by CA writers to be a favorite of the old school hockey minds and this blog could never give any credence to the old school. The Canucks wanted Dubois. Sounds of silence there. Might constrain yourself til Ollie starts playing so we don’t have to read about Flames’ players on a Canucks site. Yeah another great bit of TALENT EVALUATION from BENNING then… that you are now roasting him for! reply: He gave up 2. 1 was an empty netter. Bi-Polar Bud, you’re CLUELESS about Vancouver Canucks hockey so just do us all a favour pal and go pull your bottom lip up over your head and SWALLOW! Benning’s target was Dubois, currently 8th on his team in scoring and scoring at less than a point per game. So he might have made two mistakes in the two scenarios that were dependant on CBJ’s pick. Try to see beyond the last 30 games when you’re judging talent or reminding yourself. My reminding J.D. that Dubois was THE prized pick further illustrates the irrelevance of his trotting out Tkachuk onto a Canucks site. I thought the same thing. At the moment we seem to be lucky to have dodged the Dubois bullet. But I agree with most, way too early to judge. Given we still don’t know what we have in Juolevi and that this season was never going to see us competitive, this might be a premature analysis. If Juolevi is the next Nick Lidstrom, then Juolevi could have gone first overall in retrospect. If he projects into a first-line D, then this team takes a much bigger step toward being a legitimate contender than Tkachuk could provide. Way to early to judge, but a loooooong stretch to start comparing Juolevi to Nick Lidstrom! Let him at least make the team first. Lidstrom played his first NHL game at 21 years of age.Ollie was 17 years old 45 days prior to being drafted. It will be interesting to see how NHL capable Ollie plays in three more years time,like Lidstrom did when he first entered the NHL. Still just a little early to make calls like this. Maybe see after 3 years, not 3 months. I like the pick. Not sure yet on JV tough. Was not sold on the pick from day one. As others have said it is way too early — with not even half a draft+1 season in the books — to be making an assessment. I think it is fair to say that some of the shade thrown at Tkachuk (by many) was unwarranted, though frankly I think the bigger reconsideration should be about Chychrun whose play has not made his fall on draft day make any more sense today. I think that it was an especially strong draft for the first round overall — I had a chance to see the Boston University squad featuring four first rounders a couple of weeks ago (Keller, McAvoy, Fabbro, and Bellows) and every one looked like they should have gone in the top ten in any draft (not just Keller). Juolevi was a good pick — just because Tkachuk has had a decent if not spectacular rookie season doesn’t change that, any more than it would suggest the Blue Jackets or Oilers made mistakes with their picks. They didn’t. C’mon folks. He did not say that the Canucks should not have taken Juolevi. Just that he was wrong to rank Tkachuk at 10. The Canucks current dilemma is not Juolevi v Tkachuk, but the fact that Tkachuk is everything that JV was supposed to be, except he is already there and our guy is floundering in the minors. IF JV wants to make the NHL he should watch Tkachuk play a few games and do what he does. JV has all the same attributes plus better speed which should give him the long term edge, but I suspect Tkachuk has the edge in the proverbial “hockey sense” which JV may never make up. I’m sure the thinking at the draft was that already had their power forward with JV and a scoring winger with BB. Tkachuk would be redundant. Besides if Larson = Hall, you can always trade for a Tkachuk. JV and Tkachuk are two completely different type of players. Tkachuk is a guy who is noted for be good down low and around the net. Jake is a fast straight line power forward. Juolevi was the best available D man and filled a huge need for our team. The emergence of Stecher and Tryamkin have given reasons for people to question the decision. Juolevi is probably 2 to 3 years away and at that time he will be need. This is nothing new. To me, the trend started in 2007 when we took Patrick White over David Perron. In 2008, it was Dan Hodgson when we could have had Tyler Myers, Erik Karlsson or Jordan Eberle. In 2009 it was Jordan Scroeder when Marcus Johansen was available. 2010 yielded Patrick McNally when Brendan Gallagher was still on the board. 2011 gave us Niklas Jensen over Brandon Saad or Johnny Gaudreau. 2012 was Brendan Gaunce instead of Tanner Pearson. I know all teams can say the same thing once or twice, but this is a disturbing trend for the Canucks. On another matter, does any other team call up more players that they don’t even dress once before they are sent back? I’d like to hear the reasoning behind this as it seems like a waste of money and time, plus it must be a very frustrating experience for the player. Now waiting for the we were wrong about Nichuskin article. I agree that the jury may still be out on Juolevi vs Tkachuk but there can be no doubt that Tkachuk was the more NHL ready. And there is also no doubt that Virtanen was overrated by the Canucks. Some experts even had him falling to the second round. Benning will eventually have to answer for these mistakes. Flames Fan here. I come in peace. First of all, it really is too early to tell what you have with Juolevi. It’s a lot rarer to see defenders ready for the NHL at eighteen than forwards. I haven’t watched any of his OHL games, but his scoresheet suggests there are no problems. He hasn’t morphed into a point producing god over the off-season, but he hasn’t take a step back either. Give him time. Second, there were indeed doubts about Tkachuk at the time of the draft. He was playing on a stacked line with two older, but highly touted prospects: Dvorak and Marner. He had to be good to keep up, but to what extent were they carrying him? We now know Marner and Tkachuk were probably carrying Dvorak a bit, but that was by no means obvious at the draft. There were some reports that Tkachuk was gradually driving the bus more and more, but nothing quantitative. Tkachuck also played the end of last season with an injured ankle, leading many to question his skating ability. I’m not sure how much was known about his injury at the draft, but this may have fooled some. Prospects are often very tight-lipped about their injuries before the draft. Finally, I just want to point out that Tkachuk has surprised even his most optimistic proponents. This kid is not playing Patrick Laine’s buttery soft minutes. He’s been thrown to the wolves day in and day out from the first game of the season. He’s currently playing, not on a sheltered scoring line, but on the shutdown line with two veteran possession forwards, and he’s making them better. Tkachuk consistently posts one of the highest CF%’s on the team despite playing some of the toughest minutes on the team. I was personally hoping that Tkachuk would turn out to be another Monahan or Bennett. Namely, a kid who, in his 18-year-old season, would need a lot of shelter but would be good enough to pull off 30 points. He’s on track for over 40 and he’s providing shelter for Monahan and Bennett’s lines! That’s simply unheard of for an 18-year-old. Nobody could have predicted this. The Flames got lucky and that’s all there is to it. A player who will be more interesting to compare to Tkachuk in the near future is Puljujarvi. The Oilers needed a forward and picked this kid right before Tkachuk. I stated at the time that I thought Puljujarvi was an even bigger question mark than Tkachuck. He had impressed scouts in a couple of tournaments but had one of the worst regular season stat-lines of any prospect in the top 20. It’s one thing for a kid to get stoked for a big tourney and play the best hockey of his career. It’s quite another to prove he can bring his A-game day in and day out. Even though it’s probably still too early to tell what kind of player Puljujarvi will be, I think a lot of Oiler fans are feeling a bit robbed. Hopefully that feeling will only become stronger! Surely the Oilers burned up their draft Karma for the next twenty years with McDavid. What kind of a grinch down-votes this? This comment is better than the original article. I wish we had insightful pieces like this on our own prospects rather than the knee-jerk reactions or grass-is-greener fluff pieces that tend to dominate. I think Pulujarvi will still be a better player than Dubois and I continue to think that some of the draft fallers — especially Chychrun — will continue to make some sorry that they passed on him as he continued to drop. Thanks for the insights on Tkachuk. I thought some of the question marks about him going into the draft (not just on his reliance on line mates but especially the stuff about him only being a good player below the hashmarks) was really overblown, which I think he’s clearly showing now. It’s not just about work ethic (though clearly that helps) but also about his ability to process the game which I think has been most impressive. That’s where you see the difference with a player like Virtanen who arguably has a better pure skill set but looks lost on far too many occasions when the game speeds up. I don’t think asking Virtanen to emulate Tkachuk would work. 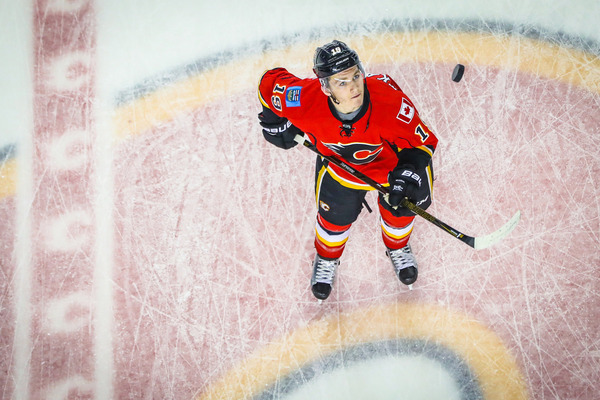 What really separates Tkachuk from a player like Virtanen is the combination of his “hockey smarts” (hate the term as it’s a blanket statement, but if it ever fit for a player it fits for Tkachuk) and his fundamental stick skills. That combo on its own seemed to be elite enough to overcome his skating issues, and as mentioned earlier, some of that seems due to the ankle injury he played through during the playoffs. Virtanen doesn’t have the elite “hockey smarts” that allow some to jump right into the bigs and contribute immediately, but it doesn’t mean he can’t learn what he needs to do.. just means he needs time, some serious patience from those around him, and maybe above all he needs to become a bit more self-aware. As for Juolevi vs Tkachuk, yeah it’s a tough short-term pill to swallow.. watching Tkachuk devour a role we could really use now and in the future. But Juolevi is (hopefully) a wise investment. Top 4 defensemen are extremely valuable, and Top 2… well, let’s wait and see what we have on our hands, but yeah.. that would be a win. On a closing note, I also wrapped my mind around the Juolevi over Tkachuk pick with this thought process: with years of Kesler and Burrows creating a sort of Canuck-pest bias that has been tough to shake, I think it’s possible Tkachuk would have a bit of a tougher time playing his somewhat chippy game in Van. It’s probably for the best both for the player and the org that things worked out the way they did. Tkachuk’s Dad was hated by his teammates, and his teams never won anything. Sure, he scored lots of points, but what is the point if the team never wins because of so much friction in the dressing room? If Junior is anything like his dad, it’s not worth taking him. Also, I believe there was some friction between Linden and Tkachuk senior during a lockout when Linden was with the NHLPA. Junior is talented, but I would have picked anyone but him.